One of the problems with not labeling everything is that I soon forget what it is I have. 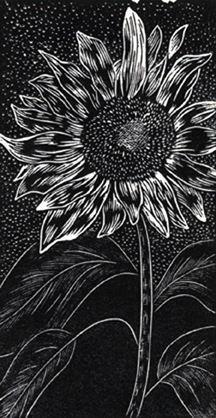 This sunflower was engraved on wood I bought in 2009. I carefully labeled when I purchased the wood, but I did not identify what wood I had bought. I think it is either pear or castello boxwood, but whatever it is it carves beautifully! The print is approximately 3″ x 6″.